Moku:Lab’s Arbitrary Waveform Generator can generate custom waveforms with up to 65,536 points at sample rates of up to 1 GSa/s. Waveforms can be loaded from a file, or input as a piece-wise mathematical function with up to 32 segments, enabling you to generate truly arbitrary waveforms. 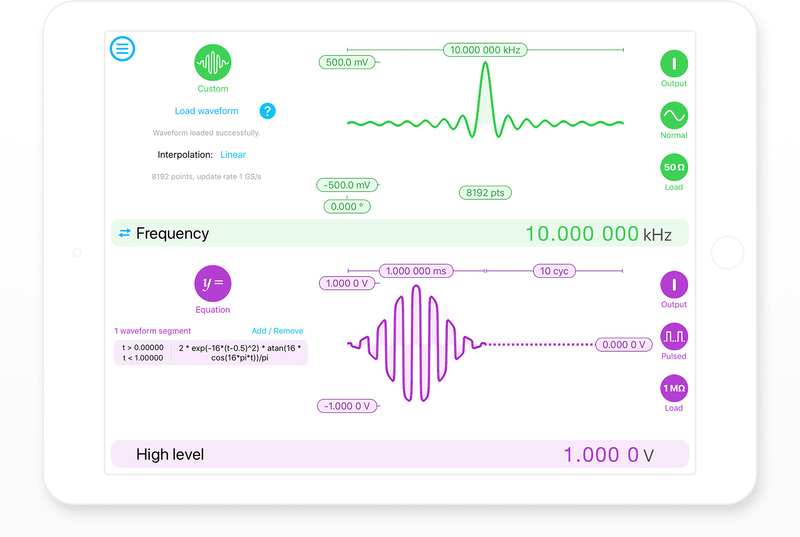 In pulsed mode, waveforms can be output with more than 250,000 cycles of dead time between pulses, allowing you to excite your system with an arbitrary waveform at regular intervals over extended periods of time. iPad interface, or with Python and MATLAB (LabVIEW coming soon). Wirelessly configure and upload your waveforms, all from an intuitive iPad interface, or with Python and MATLAB (LabVIEW coming soon). How can I upload custom waveforms from my iPad? You can load from your iPad's clipboard, the "Files app", or choose from files saved directly on the Moku:Lab's SD card. Files formatted with comma- or newline-delimited text. © 2019 Liquid Instruments. All rights reserved.